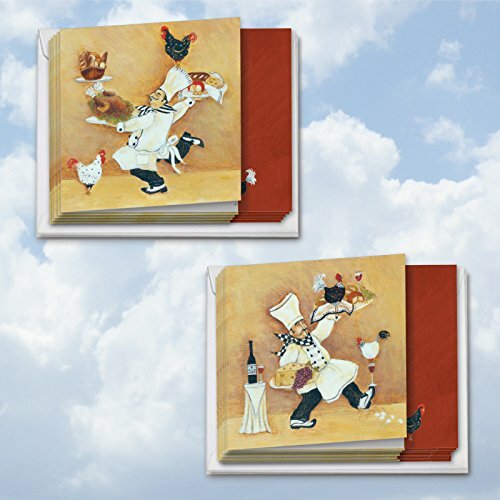 MQ4635ING-B6x2 Farm To Table: 12 Assorted Note Cards Featuring Fun, Folksy Images of a Chef Balancing Food, with Envelopes. These delightful note cards don't compromise the high standards, attention to detail and production quality our company has been known since 1980. Each of the assorted series packs in 2 fabulous, theme-related designs intended to deliver a beautiful stationery set and a big bang for your buck. Most designs are available blank or with a greeting; these versatile note cards are a great and easy way to correspond.